I was rummaging this week in my Windows documents folder – my generation’s version of a cobwebbed attic – looking for something I no longer recall, when I saw a folder simply labeled “Mom.” It’s been more than five years since my mom died of ovarian cancer at much too young an age. Five years: a blink and an eternity all at once. I try desperately to remember the sound and cadence of her voice. I trip over triggered memories of time-bleached events, hoping to add new detail to my imperfect archive of childhood. Occasionally, I pick up the phone to call her, only realizing my folly when I struggle to remember her number. Unexpectedly finding something that is about her, belonged to her or pictures her is like discovering treasure buried beneath a sun-drenched palm. Inside this particular folder was a single document, a pdf named “College Bound.” My first thought was that it was simply a wayward file, misplaced in a folder I once meant to fill with something meaningful. Still, the title wasn’t familiar, so I double-clicked, not knowing it would send me headlong into the past. Greeting me at the top of a scanned, type-written letter was a date: September 22, 1994. Twenty years ago. The year I began college. So, this was going to be about me. My eyes jumped to the bottom of the first page, where I saw my mom’s name and signature, nudging from my subconscious the faintest memory of my dad sending me something in those hazy months following mom’s death, something she had written that I’d probably like to have, something I likely had been too sad or stunned to open at the time. I learned in this moment that she had written an essay about her experience sending her only son off to college. Staring back from the screen were four pages, like the chambers of her outpouring heart, gifting me new insight into a woman I knew and loved for more than 30 years – one last conversation, however one-sided, that I never thought I’d have. It’s not even the words she wrote that struck me so deeply as the clarity with which I could hear her voice in them. This was no forgery, no parlor trick. This was my mother, as intelligent, as empathetic and as sentimental as she was in life. And that could have been enough. But this essay was more than just a diary entry. It was a submission. 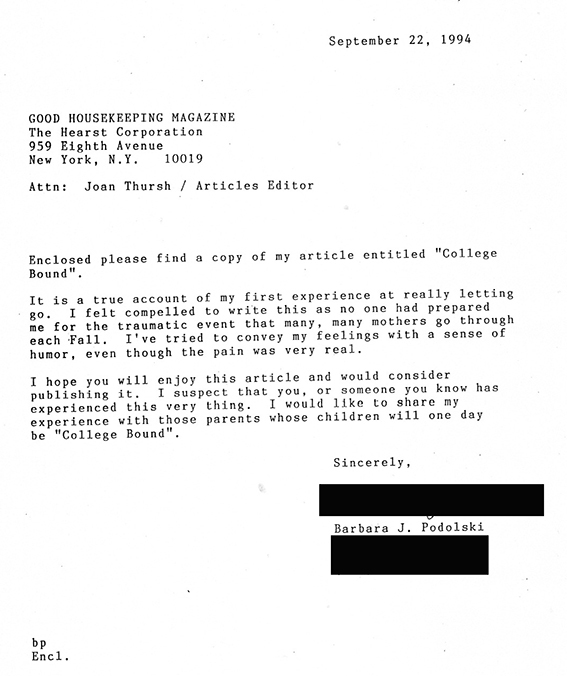 The letter introducing the essay was addressed to the Articles Editor at Good Housekeeping Magazine, New York, New York. She had mailed the essay, hoping for publication. She wanted other moms dealing with the emotional turbulence of having a child grow up and move out to not feel so alone. Selfless to the last. Now, despite the fact that I operate a public blog, and write about many things, including myself, I’m still a fairly private person. And although I’m pretty sure I’ve matured beyond the point of being embarrassed about anything my mother would say about my teenage self, I can’t help but feel a little self-conscious as I release these words into the world. My mom, however, wanted to share her perspective with others. That was her wish, and so it is mine. Good Housekeeping may not have published your essay, Mom. But I will. Thank you for the surprise… and for everything else before. Before I begin, you must take note that the opinions and perceptions expressed in this article are not necessarily those of the young man I write about. They are exclusively mine. After all, how many children view things the same way as their parents? So in order not to humiliate or embarrass anyone, I repeat, this is my story and my feelings alone. I could say it all began when he stepped on that school bus the first day of kindergarten and never looked back, but that would bring back too many painful memories and I want to deal with the present. I wasn’t prepared then, and I certainly hadn’t been prepared for what took place a few weeks ago. I sent my only child off to college. I’m sure a lot of parents look forward to the day when they once again have the house to themselves, food left in the refrigerator, and a telephone call that is actually for them. For me though, the feelings were different. Jeremy wasn’t a miracle baby in any medical sense of the word, but he was my miracle. 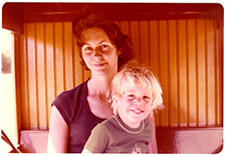 Our first son had been born prematurely in 1972 and died two days after his birth. Jeremy’s birth, on his father’s birthday, was a sign that this would be one special adventure. The years flew by too quickly as most childhoods do, but I loved every minute I spent with him. Being an only child can have certain drawbacks as I’m sure Jeremy would attest, but the one big advantage is the bond that is formed between mother and son. We always had a special relationship and could talk to each other even during those dreaded early teenage years. He was never a momma’s boy, but strong, independent, and his own person. I was always there for him and he knew that. We were friends. (For you fathers that are reading this, I apologize for leaving you out. You’re a part of the big picture, but you’ll have to write your own story if you want the readers to see things from your point of view). The thought of having a child in college seemed so far into the future, that when senior year in high school rolled around, I finally had to face reality that it was closing in. Months and months of college applications to fill out, essays to write, scholarship forms, interviews and of course that infamous, confusing, and downright frightening FAFSA were all staring us in the face. Somehow it was all completed on time and my desk now held a two foot high stack of paperwork that had accumulated. There was no turning back now. With his college selected, his registration done, and his next four years planned out for him, Jeremy felt his life was pretty much in order. I on the other hand knew that beyond the poverty level his father and I would be forced to live in, I would have an empty house and some very lonely days ahead. Now don’t get me wrong, I enjoy spending time with my husband. But after 18 years of having a child in the house, the realization that it will be “just the two of you now”, was a pretty scary thought. The months that followed had come and gone before I knew it, but I tried to make the most of them. If I learned one thing when raising an only child, it was to take advantage of being there for him every opportunity you can get. Jeremy was involved heavily in many high school activities and was an avid basketball and baseball player. Sitting at his final games and realizing that this was the end of all that, was as heartbreaking for me as it was for him. I would not only miss watching him perform, but I would miss the good friends that I had made and the social atmosphere that surrounded each event. It’s easy to say we’ll keep in touch but sometimes that’s easier said than done. Leaving high school was not only a step into the future for my son, but a step into a very different kind of life for me. Graduation came too quickly and the final summer of still being “just a kid” was over only too soon. Jeremy’s summer job was necessary to help save for college expenses but it left little time for keeping all those promises that he and his friends made to each other. As the days closed in I reflected a lot on the past eighteen years and how lucky I was that I had been blessed with the joy of motherhood. I was so proud of all his accomplishments and the young man he had become. In spite of my sadness that he would soon be leaving, I was filled with eager anticipation of the wonderful experiences and opportunities that were in his future. And then – the awaited day arrived. No one had gotten much sleep the night before, and we all got up at the crack of dawn to make the journey I had dreaded all these months. We had to be at the college at 8:00 A.M. to start the moving in process. An ordeal that remains in my mind as a blur. We had borrowed a truck for the move, and it was packed with everything Jeremy needed and wanted to make his new room feel as familiar and as comfortable as his old one had been. As we pulled out of the driveway and started on our way, he again never looked back. We arrived at the college as scheduled, unloaded Jeremy’s belongings on the lawn, and he and I went inside to begin the ordeal I mentioned earlier. If you’re not a person with much patience, do not attempt to try this. As in our case, I wisely left my husband to wait outside. The line was long and consisted of a maze of people winding around the room and down the hallway into another room. Inside that room were numerous tables each person had to stop at to receive keys, identification cards, class schedules and armfuls of more information that was supposed to make your first day simpler. I say, who are they trying to kid! It was overwhelming to say the least, and a lot of people looked confused and were much less prepared than we were. After more than an hour we emerged back into the daylight. With that task behind us, we loaded our arms with boxes and climbed the four flights of stairs to Jeremy’s dorm room. I would now get my first glimpse at where he would be starting his new life. I stood in the doorway in a numb-like state and looked around. This wasn’t at all how I pictured it. My god it’s so tiny. How can two people possibly live in here? I was heartsick and couldn’t imagine being confined in this tiny space day after day. There was barely room to walk and where would all the boxes go that contained the necessities of life? I took a deep breath and waited patiently while father and son made numerous trips up and down the stairs to bring in all Jeremy’s belongings. I could visualize now that his things would probably all fit, but there certainly would be no room for a roommate. This was definitely a place for one occupant. They must have made a mistake! Jeremy seemed troubled and his lack of sleep was catching up with him. He didn’t seem enthused about unpacking and deep down I thought he would prefer to load the boxes back up and go home. That’s certainly how I felt. Trying to be optimistic wasn’t easy especially when the R.A. stopped in and mentioned that last year this floor was the worst one in the residence hall. Just what a parent needs to hear. We eventually got everything unpacked and organized as well as could be expected. I knew once Jeremy’s roommate arrived, it would all be changed. We decided to hit the bookstore next which made the first ordeal at the beginning of the day seem like a piece of cake next to this. Talk about a tiny room! We left my husband at the far end of the room so he could breath and for an hour I could almost spot the top of his head over the crowd. There were so many confused parents and students and the shock at the cost of the books was on all their faces. Our enthusiasm was next to nothing but we had to do it. Finally finding what he needed and waiting in line another forty-five minutes was so exhausting, that when they totaled our bill and said it was over $300, I almost didn’t care at that point. I just wanted out of there. We attended the other events that were scheduled throughout the day and I knew our time left there was growing shorter. We would soon be expected to leave as the students had various meetings and activities to partake in. We went back to his room and tried to talk, but what can you say when your heart is breaking? He seemed so young all of a sudden and I didn’t want to leave him. I knew he was apprehensive but he wouldn’t show any emotion. The time had come to say good-bye and my husband practically had to drag me to my feet. Jeremy walked us to the parking lot and I didn’t want to let go. I hadn’t felt this way since he was two years old and had to go into the hospital for minor surgery. I can still remember the feeling in the pit of my stomach when I had to leave him at the O.R. door and they wheeled him away. I was having those same feelings now. I knew he needed me. How could he figure out all this on his own? I hugged him tightly and watched him walk away. I waited, but he didn’t look back. I wasn’t prepared for this and could hardly bear it. This wasn’t how I was supposed to feel, was it? Shouldn’t I be happy? After all, wasn’t this what we planned for and dreamed about? I just stood there and cried while my husband held me. I never felt so utterly miserable in my life. Those were my feelings on that day. Feelings that were filled with very strong emotions. Of course I can look back now and feel a bit foolish at all my anxieties, but I won’t apologize for the love I felt. A mother’s love. College life agrees with Jeremy and he’s as happy and content as I hoped he would be. He’s made his adjustments as well as I’ve made mine. I still stand in the doorway of his empty room and ask myself where all the years have gone. I can still picture a beautiful, towheaded little boy so young and curious and just learning about life. I smile as the tears roll down my cheeks. Letting go wasn’t easy. It was one of the biggest challenges I’ve faced. But as I took that painful step forward and into the future, I knew that someday, when the time was right, he would finally turn around and “look back”.